Your website traffic doesn’t matter. It’s only a vanity metric. What?? Yes, you read that right. Your website traffic shouldn’t be a core metric or key performance indicator (KPI). You should be fired if you’re an executive asking for traffic reports. Are you generating traffic reports because your management team demands it? Update your resume and find a new job. Shocking? Maybe. But you’ll soon understand why. Search the earnings reports of Amazon, Apple, and Google. What do they say about website traffic? Did Jeff Bezos rise to be the richest man in history by focusing on web traffic? Did Bill Gates lose his lofty position as the richest man by failing to focus on web traffic? Of course not. So why are you worried about web traffic? Make a difference to your business. Get the Lead Generation KPI & Metric Dashboard that your executive team has been waiting for. Manage your business better by tracking the most important metrics. What are your core business goals? Your metrics and KPIs should align with your core business goals. This alignment needs to go from the top of the organization to the bottom. Here’s an example of what goes wrong when you fail to do that. You probably believe the industry axiom that what gets measured gets done. And you are right. Here is what happens when you make web traffic a KPI and tell your team that is how they’re measured. EXAMPLE: A nearshoring company approached us to help them with their SEO. Let’s call them iTech. They recently fired their agency and wanted us to increase their web traffic. We looked through iTech’s analytics. They had plenty of traffic, but only one in a thousand visitors was completing a contact form. That’s a 0.1% conversion rate. They didn’t like our advice. We told them their biggest problem wasn’t traffic. But, they rejected us and hired a different agency that promised them more traffic. We heard nothing for two years and then we got another phone call. After two years they fired their second agency and called us again. Yes, you guessed it. They wanted us to generate more traffic for them. We asked them what changed over the last two years and they said nothing. iTech hired and fired two agencies. Both agencies had the same KPIs that focused on web traffic. Both agencies increased web traffic. Both agencies got fired for doing what they were asked to do. But neither agency drove the revenue iTech was hoping for. If we accepted that job, we would be the third agency they fired for the same reasons they fired the first two. What gets measured gets done. iTech’s KPIs focused on web traffic, so that’s what got done. But web traffic is a vanity metric. It isn’t aligned with iTech’s core business goals. And it’s not aligned with yours. Find the right traffic source (Google, Bing, Facebook, Twitter, etc.). Find the right landing page on your website to send traffic. Fund your right traffic source to drive complete strangers to your website. The complete strangers land on the right landing page. Then they buy your product online or call you and request you take their money. Your new customers are so happy, they send their friends to you. You fire up a fat cigar, pour an expensive glass of wine, and bask in the genius of your marketing. The ideal sales funnel that every business wishes were true. The important word is “ideal.” Anytime you hear the word “ideal” substitute with the phrase “not real.” Yes, ideal is not real. Now you have the KPIs for the not real sales funnel. Do you want the KPIs for a sales funnel that actually works? You live in a fantasy world if you believe people will come to your website and complete your contact form in a single visit. That’s not how people work. Unless what you’re selling is both illegal and addictive, nobody wants to be in your sales funnel. You need to romance them. Read How to Get More Sales from Your Website Before You Go to Bed Tonight to understand that better. Adjust your strategy to make your prospects hurl their contact information at you. You want them on your radar long before the sale. This strategy is a process to get prospects on the phone to talk about your product or service. Align your marketing KPIs with the steps in that process. Assign a value to each step in the process that is traceable to your core business goals. Let’s look at the building blocks in this strategy. Think of something you bought between $500 and $10,000. What did you do leading up to the purchase? If you’re like most people, you did online research. In fact, 60% of the buyer’s journey is self-education. Do you sell the way you like to buy? We find most companies aren’t aligned with their buyer’s needs. Map your buyer’s journey and include the parts where they self-educate (like you would if you were them). Your funnel should have a combination of content and lead magnets for each stage in the funnel. ToFu is Top of Funnel content that engages your buyer early in the process. The best ToFu intercepts your buyer before they’re thinking about your product or services. This is your best and cheapest place to acquire a lead. You’ve achieved a micro-conversion when they give you their contact details. You get that in exchange for a piece of ToFu downloadable content. MoFu is Middle of Funnel content that moves your buyer along. It helps them evaluate different options, so they can make an informed decision. This is not sales literature. Focus on helping them learn. You benefit by being the trusted advisor. You’ve achieved another micro-conversion when they complete a MoFu form. BoFu is Bottom of Funnel content that informs your buyer of your solution and how it helps them achieve their goals. While this is a piece of sales literature, you want to maintain the tone of teacher. Why? First, they will notice and recoil as soon as you switch to selling mode. Second, people trust teachers. As a general rule, if you have the attention, product, and trust, you are way ahead of your competitors. You will most likely get the sale. Every time your prospect exchanges personal information for content, you’ve achieved a micro-conversion. You should use progressive profiling to learn something new about them in each stage. Forecasted revenue for micro-conversions at each stage in the funnel (ToFu, MoFu, BoFu). Month on Month (MoM) and Year on Year (YoY) growth. Forecasted time to core product revenue. Hook your customer early with either a low-cost impulse sale or a commitment of time. Your goal is to transform them from an observer to a participant. This triggers an influential principle called consistency. The sooner you exchange money, the better. Something magical happens when a prospect pays you money. First, they transform into a customer. Second, they experience a powerful emotion. They are grateful for giving you money. Of course, they are more grateful the more you imbalance your delivery of value for their money. If you want to increase your conversion rate, increase the imbalance. This is not where you make money. If you’re lucky, you can cover your cost of advertising in this step. You may sell a high-end service and think you don’t have an Entry Point Offer. Yes, this can seem hard. But you can splinter off some aspect of your product or service. You need to get creative. Get a commitment of time or money as soon as possible. If you can’t think of an EPO, then find a commitment of time. Use a webinar, meeting, assessment, or some other commitment of time as your EPO. EXAMPLE: Car sales. Obviously, you can’t sell a headlight as an EPO. You’re either buying the car or you’re not. One night after work I went to a car dealer on an impulse (NOTE: I’m not an impulsive buyer). The dealer suggested I take the car home for the night and bring it back in the morning. I went back the next morning with my checkbook and bought the car. The dealer was shrewd in many ways. He built-in a commitment of time. I had to bring the car back to the dealer. Forecasted core product revenue with MoM & YoY growth. This is your last stop before selling your core product or service. Money should exchange hands at this point. You want your prospect to experience your product or service, but not in its full measure. Just like every other step in the funnel, you want to deliver value and the value needs to exceed what your prospect paid. Your goal at this stage is to excite them to the point of action. The price should be higher than an impulse purchase, but low enough so it’s discretionary. This is not the time to ask your prospect to fight for extra budget. Not yet. Don’t do a free trial. If you have a subscription-based product or service, you should charge for it. Heavily discount it, but don’t make it free. Charging helps you identify who is serious and who is looking for freebees. You also trigger that magical moment where your prospect becomes a customer. 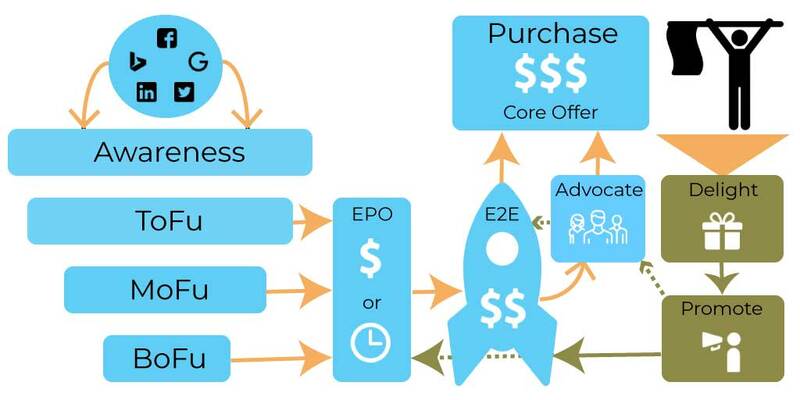 The purpose of this stage is to propel your customer into buying mode. You want to be strategic in your delivery of value at this stage. Your prospect probably needs to convince someone else before they can commit. It may be a spouse, business partner, boss, or board of directors. Deliver this stage in a way that is easy for your prospect to sell others on your product or service. This could be a report, dashboard, etc. The easier you make it for them to sell, the higher your conversion rate. You want your metrics and KPIs to align with your core business goals. Everyone on the team needs to understand how their work advances the core goals of the business. Better yet, your ability to run your business increases the more your KPIs align with the core goals. This brings us to the last three KPIs. Customer Lifetime Value (LTV): The net profit of a customer over a lifetime. Cost of customer acquisition (CAC): This includes the cost of marketing, sales and advertising. Example: SharpSpring is a marketing automation platform. Their monthly fees vary but are typically less than $1,000. They happily reported to investors that their cost of customer acquisition was $6,200. Yes, it takes more than 6 months of revenue to cover their CAC. But they also reported an LTV of $50,000. Would you spend $6,200 to earn $50,000? I hope so! That’s a 700% ROI. You optimize your business by maximizing the ratio of LTV to the cost of customer acquisition. Every KPI is traceable to the core objectives of the business. Your digital team has insight into how their work achieves core business goals. They can now make better decisions in their daily activities. 1The Persuasion Handbook: Developments in Theory and Practice, Keltonv. L. Rhoads and Robert B. Cialdini, Sage, 2002, Chapter 26, page 513.